American families spend about $2,200 a year on home utility bills, according to the U.S. Department of Energy. On top of that, people spend countless hours doing repetitive household tasks like turning the heat up, closing the blinds and turning the lights off. What if all that could change, though? What if—like your old brick carphone—your home could be smarter? Installing a programmable thermostat, like The Nest Learning Thermostat, is one way to reduce your home’s energy usage. It also makes waking up, coming home and going to bed a lot easier because, after week or two after, it learns your schedule and desired home temperatures and adjusts your energy usage. Better yet, you can control the thermostat from your smart phone, tablet or computer. So, if you decide to go out last minute, the thermostat senses that no one is home and saves energy while you’re away. For people on the go, it’s the perfect solution for an easier, more environmentally-friendly lifestyle. Let’s face it. You’ve had that moment of irritation when you come home and realize that your bedroom light has been on all day. It’s such a waste, and everyone’s done it. In fact, Energy Star estimates that 12 percent of your home’s energy is used on lighting. But, this can change drastically by exchanging your lighting system for remote-controlled LED lights, like the Connected by TCP lighting system. This system enables you to dim or turn lights on or off from any Wi-Fi enabled device. The app can schedule times for your lights to turn on or off automatically, as well. With a remote-controlled lighting system, you no longer have to enter a dark house at the end of the workday or needlessly waste energy by forgetting to turn the lights off before you leave. Imagine protecting your home from hot solar rays or cold winter drafts while looking cool and stylish. No matter what style of home decorations you have, you can open or close your drapes with the touch of a button with a motorized rod. With options from The Shade Store including classic pleat drapery, modern grommet drapery and everything in between, these drapes please the eye as well as your inner gadget-loving soul. Soon, all your kitchen appliances will be able to connect to your Wi-Fi and be controlled from your smartphone. General Electric now offers wall ovens and ranges starting at $1,400 that connect to Wi-Fi so you can preheat your oven from the grocery store. Other appliances like refrigerators, washers and dryers, dishwashers and water heaters offer similar features. The Wi-Fi connectivity gives you what you always wanted in your home: all the help without any of the judgement. 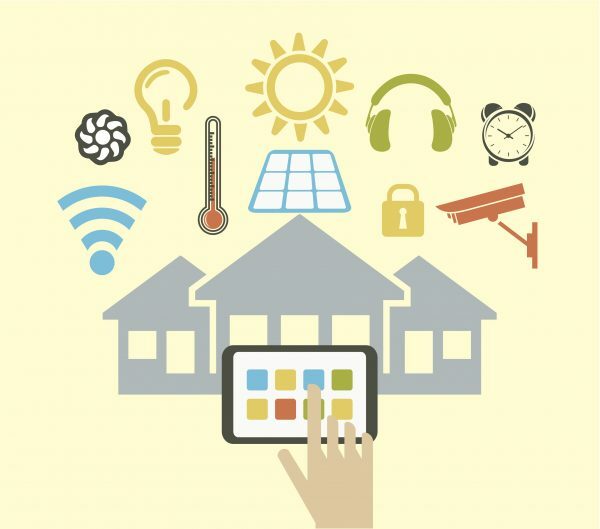 With the addition of a few smart appliances, your home can join the future. The tasks that used to annoy you can be delegated to a computer. These devices save you time and money and give you the freedom you always wanted.